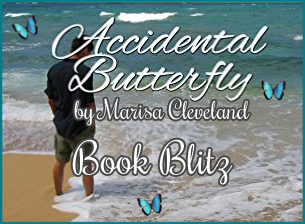 Welcome to the Book Blitz for Accidental Butterfly by Marisa Cleveland. This is a young adult romance with light paranormal elements. It released on July 5th and is available for sale! Alive, Kate Dunlap breezed through high school with meaningless friendships and relative ease. But after an accidental overdose ends Kate’s human existence, she’s granted the opportunity of a lifetime. Return to Earth. Save Jake Barton. Prove her worth. Marisa Cleveland loves to laugh, hates to cry, and does both often. As a writer, she writes. Every day. If she couldn’t express herself through writing, music, and dance, she would die. Cleveland, who has a Master’s degree in Educational Administration in Organizations, joined The Seymour Agency in 2011 after she ended an eight-year career teaching students in language arts, grades 6-12. Previous to teaching, Cleveland worked as an assistant director for a graduate school in Washington, D.C. before settling in Southwest Florida. She loves to connect with writers and readers through social media.